This book is the second edition which was originally published in 1975 when doll collectiong was a secret passion. Spinning Wheel Complete Book of Dolls Volume 2 is an excellent reference tool, and the collector will find over 80 fascinating stories about their passion. 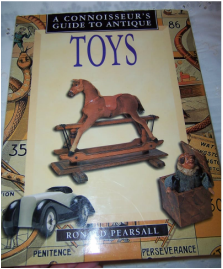 This book builds on the foundations laid in Romy Roders first book "Collecting Antique & Old Dolls" which we have for sale as well. Romy gives a detailed coverage of bisque-headed dolls as well as chapters on other types of dolls such as composition, celluloid, rubber, wax, all-bisque, wooden, cloth and doll's house dolls. It also covers dolls' accessories dolls' houses and goes on into cuddly toys, rocking horses, pedal cars, the wonderful world of tin toys, both foreign and Australian, games and musical and visual toys. There are about 250 black and white photographs and 70 colour plates. There is an appendix illustrating manufacturers markings and trade marks. Celluloid dolls were firm favourites with children before the hard plastics took over in the mid 1950's , and have now become a popular collector's item. This book offers a brief history of the celluloid doll industry. Details of well-known manufactures all over the world are given. The various types of celluloid doll are explained and definitions of Diddums and Kewpies are provided. Sticker on inside cover with name of previous owner. This book shares the results of Lydia Richters painstaking research and enthusiasm. It shows us her private collection, combined with serveral interesting and valuable loaned pieces. Her text clarifies questions about doll mark, materials, technical details of manufacturing and important collecting criterea. Some of the dolls discussed are: Simon Halbig, China Head dolls, Armand Marseille, Kestner, Max Handerwerck, Alt, Beck & Gottschalk, Kammer & Reinhardt and many more. It still retains its dust cover which is usually missing. This book explains where dolls can be found and how to distinguish a high-quality doll. The book describes Lydia's experiences with her own doll collecting. This outstanding collection of beautiful French dolls will fill every doll lover with enthusiasm. Dolls are beautifully photographed and described in detail. Lydia shares information and expertise with collectors who want to avoid poor investments and disappointments. This book is an outstanding guide for the beginning or advance collector. It explains the criteria of collecting, and tells how to identify reproductions and forgeries and shows doll costumes in detail. It is great to actually have the dust cover on this book, as they are usually missing. 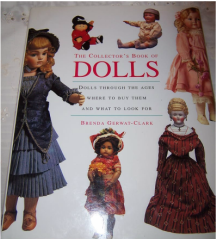 DOLL BOOK THE COLLECTOR'S BOOK OF DOLLS BRENDA GERWAT-CLARK aud$ 12.99. 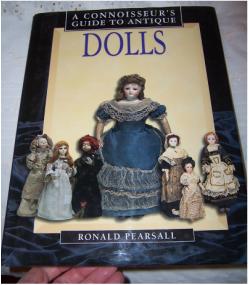 This book provides a comprehensive survey of the relatively new and fascinating hobby of doll collecting. This is an introduction to the whole range of doll collectibles from the relatively inexpensive celluloid and composition dolls to the gorgeously dressed 19th Century fashion dolls, the charming French "bebes", and the early 20th Century German character dolls. Lavishly illustrated with examples of all kinds, the book contains valuable tips and hints for the novice and experienced collector alike. Hard cover book with dust cover . (original price $33.00 on top of one corner. See pictures. "One of the earliest toys ever discovered was a tiger with a hinged mouth from 1000BC. Now we have electronic robots; sophisticated train sets and dolls which walk and talk. This fascinating and comprehensively illustrated book describes how collecting toys has now become a serious pastime. Objects once intended for children are eagerly sought and highly prized''. Have a look at the photos in this book - they are beautiful. "Álthough dolls were intended primarily as playthings for children, some are so fine that they are more art objects for the collector than mere toys. Here is an authoritative and fully illustrated account of the development of the doll - from simple clay and wood models of early times to the exquisitely beautiful china dolls of later years. If you are after several books then just email us and see if they come in the 3kg weight level for the Australia Post prepaid satchel.